Alex Tew, the enterprising student who started Million Dollar Homepage, is at it again. Before he was selling ad pixels on his site for $1 a pixel, but this time, he is looking to charge $2 with Pixelotto. There's a twist however. Apparently, he is planning on holding a lottery where one lucky winner who clicks on the right ad will win $1 million. It's a clever way to get people to click on ads, and it might work. Although the site launches December 5, he's already sold some of his inventory as you can see in the screenshot to the left. What's interesting is that an arbitrage opportunity exists for smart advertisers who do decide to place an ad on the site. Since users have to click on every ad at least once to have a chance of winning, you're guaranteed a massive amount of traffic assuming Pixelotto takes off, which it has every chance to since $1 million is at stake, and a fair number of bloggers are writing about it. If even only a small percentage of visitors click on ads on your site, you can easily make back your original ad investment. Every user can only submit 10 entries a day, apparently, so depending on the length of the lottery, it might not be possible for a user to get through the entire ad inventory. I have some very exciting news I’d like to share with you. Next week, on 5th December, I am launching a new venture called ‘Pixelotto’. they have - and the more traffic you receive. chance to get on-board before everyone else. I look forward to welcoming you on-board for this new pixel adventure! I beat him to it! 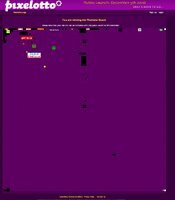 I set up my site a good while before pixelotto was announced! You can check my site out here www.cashcells.co.uk : The site offers the user clicking on the adverts the chance to win $$$, the total size of the prize is directly related to the number of adverts. Its a better format for pixel ads..